A top leader from the Russian Orthodox Church on 22 June wrapped up a visit to China, saying that the church hopes Orthodoxy may flourish in China despite present constraints. 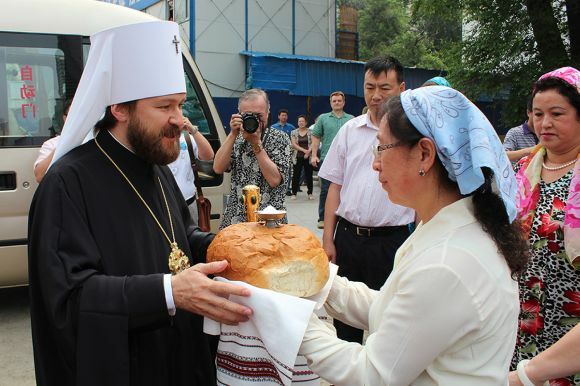 Metropolitan Hilarion, chairman of the Moscow Patriarchate’s department for external church relations (DECR), was on a working visit to China to explore Russian-Chinese religious cooperation. On 19 June, Hilarion led a delegation to Beijing for a consultation in which the “current status of religious organizations” in China was discussed, including the “complex issues associated with the position of Orthodoxy in China,” as reported by the DECR website. DECR said that participants “noted the contribution of religious confessions in the strengthening and expansion of cultural ties” between the two countries. Among the participants from the Russian side was a Buddhist teacher, while Chinese representatives included government officials and religious leaders from the Catholic, Islamic and Buddhist communities. He also expressed his hope for the Chinese Autonomous Orthodox Church — which was a daughter church to the Russian Orthodox Church — “to occupy a proper place among religious confessions of China” when he visited the National Catholic Seminary in Beijing on 20 June. However, he had admitted earlier that it was “a rather difficult dialogue to normalize the position of the Chinese Autonomous Orthodox Church,” as quoted by the Interfax News Agency before his visit to Beijing. For now, Buddhism, Catholicism, Islam, Protestantism and Taoism are the only five recognized religions in China, with Orthodoxy having no place. Meanwhile, the Orthodox community of the Moscow Patriarchate in Hong Kong is celebrating the 300th anniversary of the founding of the Russian Spiritual Mission in China when the Qing Dynasty Emperor Kangxi, at the request of the Russian emperor Peter the Great, issued a decree that an orthodox mission be set up in Beijing. The parish priest, Fr Dionisy Pozdnyaev, told ENInews 22 June that prayer services were scheduled 24 June to commemorate the Orthodox Chinese Martyrs of the Boxer Rebellion. Pozdnyaev, who also assists the revival of the Chinese Autonomous Orthodox Church, spelled out the importance of a Hong Kong-based Orthodox community, where local Chinese may get to know more about Orthodoxy.